Michaelee has been a business owner together with her husband, Tim, since 1992 with their real estate business, the last 17 years. 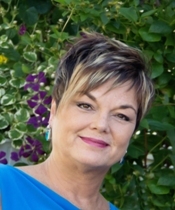 She has been a broker since 2000 and owner of REMAX Homes since 2006. Tim and I have developed systems, and combined with a powerful team of experts, assures consistent service to our clients! Michaelee has accomplished REMAX International’s Hall of Fame Award in 2006, was featured in the “REMAX World of Winners Success Stories” book 2007 and holds many designations to include: Council of Residential Specialist CRS; Graduated Realtor Institute GRI; Certified New Home Specialist CNHS; Residential Construction Certified RCC; Internet Marketing Professional ePro; and Certified Distressed Property Expert CDPE. She also provides Interior Home Décor Design Consultations and assists with staging for homes ready for sale. She is a mother of 3 sons, a certified Yoga Instructor and loves gardening and art of all kinds. She and her team provide full time real estate services for the Western Greater Minneapolis areas.